OAKDALE, La. – The last (and only) point guard to lead the University of Michigan to a national championship sits behind the high fences and razor wire of the federal correctional institution here, a joyless expanse of turf carved out of the woods in the rural flatlands of central Louisiana. Rumeal Robinson will spend this weekend, like every weekend these days, in the humble Rapides 1 housing unit, watching college hoops on TV. Some 360 miles northwest of here, a little more than five hours by car if you avoid the speed traps outside Glenmora, the current Michigan point guard, who like his predecessor is a bit over 6 feet, tough and talented, has gotten the Wolverines to the Sweet 16 of the NCAA tournament for the first time in nearly two decades, eyes on potential glory, mindful of past ones. Trey Burke will spend this weekend, or at least Friday night, in the opulent confines of Cowboys Stadium, playing college hoops on TV. "Trey Burke," says Rumeal Robinson, "is a great player." "Yes, I know about Rumeal Robinson," says Trey Burke. "I have seen those free throws." Those free throws. Burke has never met Robinson and isn't an expert on his game, career or life, but he knows, if nothing else about him, those free throws. Twenty-four years ago, Robinson hit two that rank among the most clutch in the history of basketball. Sent to the line with three seconds remaining in overtime of the 1989 national championship game and Michigan trailing Seton Hall, 79-78, Robinson stared down immense pressure and drained the game-tying shot. Not just drained it either, but drained it perfectly, just the slightest graze off the back of the rim before rippling the net. Moments later he did it again for the national title. "It says so much about him as a player and the will and the drive he had to handle that," Burke said. "Not a lot of players can step up to that kind of pressure and hit the free throws. That was big time." Today Robinson is not big time, his world far bleaker and monotonous. The pressure of prison is far greater than some foul line. He's serving a six-and-a-half year sentence for a 2010 conviction on bank bribery, wire fraud, conspiracy to commit bank fraud and making a false statement to a financial institution. He was found guilty of fraudulently borrowing more than $700,000 from an Iowa bank. He still owes $1,184,615 in restitution. There aren't any shining moments at FCI-Oakdale. Once the toast of his sport, he's little more than federal inmate No. 82671-004. While there are basketball courts out back, Robinson, 46, doesn't play. He stays in shape mostly by taking long walks in short spaces, round and round the yard, nowhere to go. Part of his time is spent following basketball, and of late that means a lot of Michigan as Burke and coach John Beilein have at last rebuilt the once nationally powerful program. Friday they take on top-seeded Kansas in the program's first Sweet 16 appearance since 1994. "I'm not satisfied," Robinson said during correspondence with Yahoo! Sports over the past two months. "This is where Michigan should be and always should be." In the aftermath of those free throws, the last of his 21 points that night, Robinson was heralded for his poise, nerves and fundamentals. He reenacted the shots in the White House Rose Garden before charmingly passing the ball to President George H.W. Bush and saying, "you can take a shot." He was the 10th pick in the 1990 draft, eventually playing pro ball for a dozen years, six of them in the NBA. He made millions. And even if he was inconsistent as a professional, he always remained famous for that trip to the free-throw line. It was heady stuff for a kid who came to the United States from Jamaica at age 10 only to find himself unwanted by his birth mother. He spent weeks homeless, sleeping in apartment hallways and stairwells and downing all the leftover food he could at his Cambridge, Mass. elementary school. He was an immigrant in need of a chance. Helen and Lou Ford gave it to him, taking him in initially and later adopting him. They'd go on to raise dozens of kids in Cambridge either adopted or foster. Robinson was their star though. The city eventually named their street Rumeal Robinson Way. He blew his NBA millions, he admits, through wasteful spending and a taste for high-priced toys. His attempts to become a businessman after basketball, notably his plan to open a resort and casino in his native Jamaica, unraveled and led him here. He strongly maintains his innocence, partly on the grounds that his request for new representation just before his trial should have been granted. He says while he did a poor job of handling sophisticated loans and debts, he is not a criminal. Robinson points much of the blame on prosecutors and Helen Ford. In an effort to help fund the casino/resort project, his adoptive mother signed her home over to Robinson's business group – she says unwittingly. The house was eventually lost to foreclosure. Nearing 70, the now widowed Helen lives in a smaller apartment in the Boston area. Robinson claims she "conspired with the feds" in his case. She also took part in numerous media stories that, he said, made it seem like the lost house was the center of the case. All while, he said, discounting the Mercedes, the mink coat and the other gifts he provided her through the years. She eventually testified on behalf of the prosecution, a devastating blow Robinson said. "People are going to believe your mother when she says you were doing things," Robinson said. "… The damage was done before [I] stepped into court. There's a lot of misunderstanding about my case." There is little regret, plenty of defiance. Ronald E. Longstaff, United States District Judge for the Southern District of Iowa saw it differently. He criticized Robinson's stance as a demonstration of "absolutely no remorse, absolutely no acknowledgement of fault. The record is replete with significant fraud." Regardless of Robinson's protests, the world is cruising along without him. The Michigan team is full of the offspring of former basketball greats – Timmy Hardaway's kid, Glenn Robinson's kid. CBS loves cutting to them in the stands. A similar shot of Rumeal, the one who delivered that lone title, the undisputed hero of the tournament, would've been natural. Instead he's here, locked up in the middle of nowhere Louisiana. FCI-Oakdale may not be the worst prison in America, but it isn't Camp Cupcake either. So he has memories. And he has the vision of Burke on his television, somewhat similar build, somewhat similar game, a point guard in charge of the maize and blue, making this long-time football school get into basketball again. It's something Robinson wondered if boosters and administrators would ever allow again. So much of the Michigan story, of Michigan's history hinges on the Fab Five, the precocious group of freshmen that arrived in the fall of 1991 – Chris Webber, Jalen Rose, Juwan Howard. They wore black socks, baggy shorts, threw non-stop alley oops and made consecutive championship games. They also got into major NCAA trouble, souring the school on the sport. And they never won it all. The Glen Rice-Rumeal Robinson Wolverines did. And if it wasn't for that title in 1989, wasn't for the program built through the 1980s, would the iconic Fab Five have even considered Michigan? While across the country the memories are of Webber and Rose, within the program a nod of respect remains with the team that actually hung that lone national championship banner in Ann Arbor. "A lot of people talk about the Fab Five, and they were wonderful, one of the best teams you'll ever see in college basketball," Burke said. "But the '89 team is the best one to ever play at Michigan in my opinion because they won the national championship. "Winning a championship is winning a championship." Robinson is not sure he agrees. He points to the 1985-86 team of Roy Tarpley and Butch Wade as a contender and notes that "the 1987-88 team was big, with great skill players was better than the '89 championship team" even if it was knocked out in the Sweet 16. Those teams are hardly ever discussed nationally though. Everything is the Fab Five. "The Fab Five was a very good team," Robinson said, hardly bitter. "People talk about the Fab Five because the 89 team's story has never been told." Stuck in prison, Robinson isn't helping tell it very well. At this point, though, it isn't a priority. His release date isn't until September 2016, although he could get out as soon as the summer of 2015. He keeps arguing his side of the story and working through the long, repetitive days. At least the tournament is on. He's a five-hour drive from the Kansas game, a five-hour drive from the Sweet 16, a bitter five-hour drive he once would've taken in a heartbeat – he once owned a Maserati Quattroporte after all. Now he can't even attempt it. 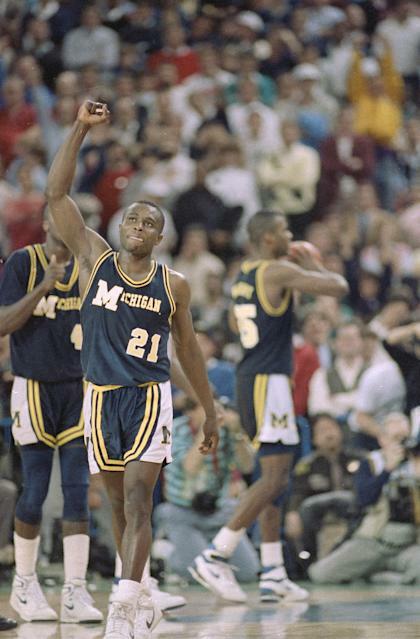 Robinson instead will be stuck watching on a prison television, lifted, but only so much, by the understanding that no matter the depths of his current predicament, what he did as a player nearly a quarter century ago is still appreciated by Michigan's current star point guard. "Hitting two free throws to win the national championship," Burke said. "That'd be a dream come true if that happened to me." The fences and guards and razor wire can't diminish Rumeal Robinson's once dream moment. It's his current reality that's the nightmare.